Medium: lithograph (after the Fernand Leger painting). 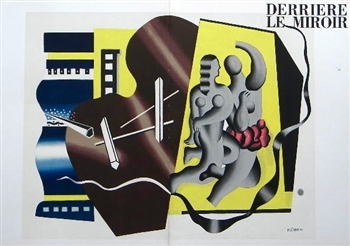 This classic Cubist composition was printed in 1955 for the cover of Derriere le Miroir no. 79-80-81, published in Paris by the Maeght atelier. The total sheet (including margins) measures 15 x 22 inches (380 x 560mm). Issued as a folded sheet with a center crease and text on verso. Signed by Leger in the plate (not by hand). Condition: as this was the actual cover, there is some minor wear and a few marks in the margins.